Just like every year, we all were discussing to go on an adventure trip with the ToXSL family and spend quality time there. After long discussions, we made our minds to visit something offbeat- Narkanda. Narkanda is a peaceful place which is untouched and an unspoiled place by tourism, it is a mere 60 km drive from Shimla. What makes Narkanda special is its unique beauty-higher reaches, plentiful summer sunshine and vibrant white winters in abundant apple orchards. We all started from Chandigarh in the evening at around 9.30 pm. We started with our random gossips and music, and of course, the loud beats. At around 1.30 am, we stopped for dinner and took a short break. After fulfilling our tummies, we continued our journey with full excitement. At around 5 am in the quiet morning, we all reached our hotel which was just 4 km away from Narkanda. Unpacking our backpacks, we all rested for a couple of hours. After waking up with a hot cup of coffee, we all enjoyed the view in our balconies, the shining sunrise, the refreshing moments! Words are simply not enough to describe that scenic beauty. After getting ready, we all gathered to have breakfast and headed to the trekking. After having the meal, our team member instructed us about the do's and dont's during the trekking and about all kind of safety measures to follow during the trip. Soon after, we all started the trekking. Away from the noisy crowds, the valley welcomed us with a mesmerizing view of Himalayan mountain ranges on one side along with tall pines, spruce and scattered maple and aspen trees on the other side. The narrow curvy road made the trip more memorable. We all did many sports activities along the way and enjoyed skiing as well. Now it was the time to visit the major attraction in Narkanda- the “Hatu Peak”, which is almost 8 km by road from there. The trek through the varied colors and serenity of fascinating Deodar jungle, scattered red maple leaves, glimpses of mighty Himalayan peaks blinking out of pine trees made the trek more easy and surprising for us. Thereafter all were tired and we rushed to our hotel back. Taking rest for a while, all gathered at the bonfire and danced at the music beats. Waking up the next morning, all were excited to visit the splendid 'Chail Palace'. All of us got ready and rushed to the breakfast tables to have meals. 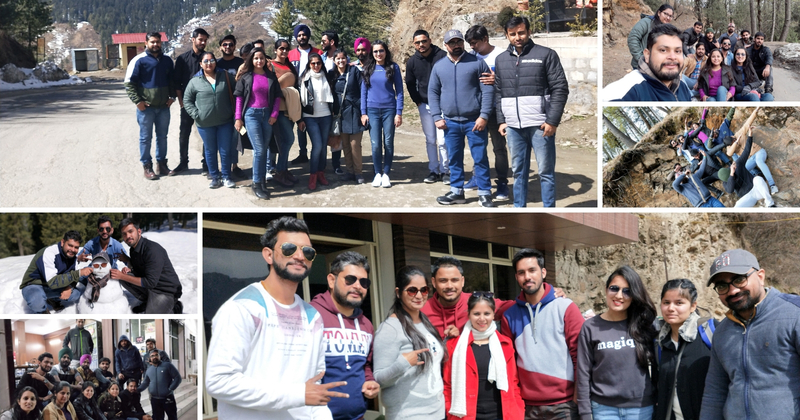 Beginning the journey to Chail palace, we had a great time hooting all the way and enjoying every moment, After reaching the Chail Palace, we had a great time there, clicking endless pictures and enjoying the aura of the place. Soon after, we all had lunch and then moved to Mohan Shakti National Heritage Park situated at Shakti Sthal which is on a distance of 12 kms from Solan. The park showcases 108 deities of Hindu god and goddesses which has been manufactured by very experienced sculpture-re made up of marbles. At around 6 pm, we all attended the 'Aarti' and made our souls contented at this heavenly place. All contented and satisfied with a bunch of memories and happiness, we all packed up to get back and say goodbye to this beautiful place. We all started at around 7 pm for Chandigarh while carrying along priceless memories, memories for a lifetime and beyond! !